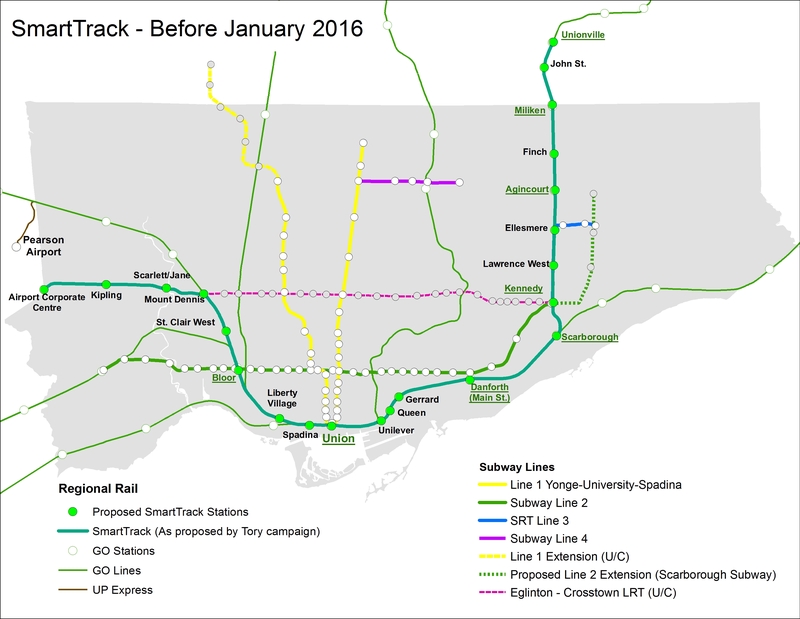 John Tory’s original SmartTrack plan, shown with the existing TTC Subway and GO Rail networks. In Friday’s Globe and Mail, we were treated to a scoop by Oliver Moore, that newspaper’s excellent transportation reporter, on behind-the-scenes revisions to Mayor John Tory’s SmartTrack rail transit platform, a topic that I discussed several times in this blog. Tory’s SmartTrack plan, dreamed up by a private-sector planning firm, was intended to connect office parks in Mississauga and Markham to Downtown Toronto, as well as serve the proposed First Gulf development at the Unilever site near the mouth of the Don River. Tory promised that it would provide relief to Toronto’s overburdened subway system, but that was never the main objective. I have been aware of rumours that Tory’s SmartTrack plan was going to be walked back due to mounting costs and technical issues of implementing the mayor’s campaign promise. The team that came up with the idea of a U-shaped rail network intended to connect several suburban employment centres with Downtown Toronto overlooked some important details, such as the availability of land along the former Richview Expressway corridor along Eglinton Avenue West. SRRA, the private-sector planning organization that came up with SmartTrack, assumed that the Richview lands were available and owned by the province, but the city owned the land, and sold much of it off for development in 2011 and 2012. The cost of building the western spur between Mount Dennis and the Airport Corporate Centre was, in all likelihood, found to be prohibitive, though we have yet to find out what the estimated costs for a tunnel along that section. The eastern section, north of Kennedy Station, would have closely paralleled both the Scarborough RT and the proposed extension of the Bloor-Danforth Subway to McCowan Road, a project that Tory also backed. 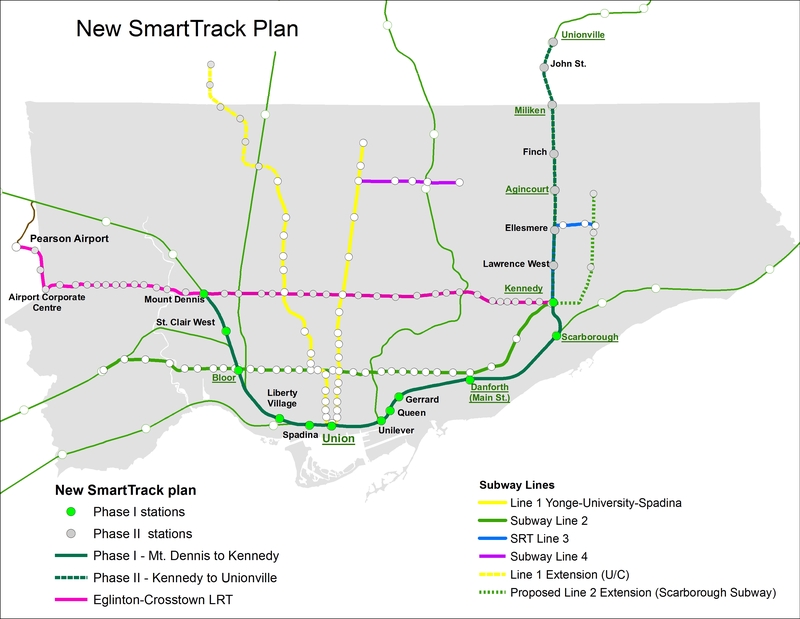 The Globe and Mail’s Oliver Moore reports that SmartTrack will cover a much shorter section than the map on John Tory’s 2014 campaign brochures. Frequent rail service will complement existing GO Transit Regional Express Rail (RER) services on the Kitchener and Stouffville Corridors, terminating at Mount Dennis and Kennedy Stations. The Eglinton West section will be covered by the “shovel-ready” Phase II of the Eglinton-Crosstown light rail transit line (ECLRT), which is already under construction east of Mount Dennis. (The provincial government deferred funding for this section of the ECLRT in 2010 for budgetary reasons.) The north-eastern section of SmartTrack, between Kennedy Station and Unionville Station in Markham, will be deferred. This new plan, which is being finalized and will likely be officially announced later this year, will cost an additional $2-billion to $3.5-billion to the existing plans for RER, in order to facilitate more frequent, subway-like frequencies, as well as complete the western section of the ECLRT. If Moore’s reporting is accurate (and I have seen maps and other materials that collaborate his report), then Tory will have to eat some crow. Spin doctors will have to figure out how to polish this turd as Tory seeks a second mandate in 2018. It’s also inevitable that the new additional service on this corridor will continue to be branded as “SmartTrack.” But this is the best solution, and maybe this is a sign that Tory is learning on the job. At the end of the day, what Toronto gets is what Metrolinx’s “Big Move” plan envisioned: upgrades of most GO Transit corridors to RER, as well as Phase II of the Eglinton-Crosstown LRT line to Pearson Airport. (The Finch West and Sheppard East LRTs are also approved, but have yet to start construction.) The paired-down SmartTrack plan, if trains are frequent enough, and with attractive transfers with the subway and TTC surface routes, will draw some riders. It could help provide medium-term relief as the [Downtown] Relief Line Subway is studied and built. But where I find myself annoyed is when I realize that we wasted over a year on Tory’s campaign slogan without any progress on the Relief Line (which will offer real, long-term relief to the Yonge Subway), the Waterfront West LRT, or other transit priorities such as accessibility at all existing subway stations. I remember during the 2014 election campaign, critics of Tory’s simplistic and flawed SmartTrack plan were dismissed without acknowledging their objections. It’s also worth noting that Tory also adopted rival Olivia Chow’s bus plan, after belittling it during the campaign. In order to provide fast and reliable transit to the Airport Corporate Centre and Pearson Airport itself, there are opportunities to refine the western section of the Eglinton-Crosstown LRT. The environmental assessment called for 15 stops between Mount Dennis and Pearson Airport, while SmartTrack would have had as few as three stops along the same section. If the ECLRT can be sped up at all, it would be worth considering. I would also be interested in whether the SmartTrack corridor could be integrated with the UP Express rail link, whose ridership started off quite low. And maybe, just maybe, the high costs of constructing the Scarborough Subway extension will also prompt a rethink, going back to the original LRT replacement and extension plan. As the Spadina Subway extension to York University and Vaughan is now two years late (and yet another $400 million over-budget), maybe there’s an opportunity to get it right there as well. It’s also imperative that proponents of the Relief Line Subway strike now. I could be giddy with the revelation that Mayor Tory’s signature campaign platform is coming undone, having foreseen the problems with his plan. But I’m not. However, I do take pleasure in knowing that we have a smarter plan in the works. This entry was posted in Politics, Toronto, Transit and tagged Eglinton-Crosstown, John Tory, Metrolinx, SmartTrack, Transit, TTC, UP Express. Bookmark the permalink.